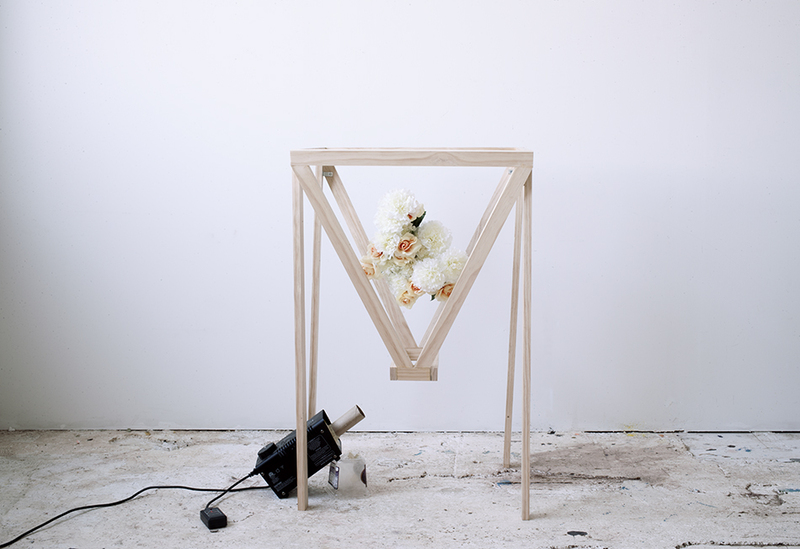 Flowers For Ghosts (Sorry I’m Late) is an 16″ x 20″ inkjet print in an edition of 5. It comes in a simple white frame. David Rodriguez was raised in the Bay Area and is currently an MFA candidate at Chicago’s Columbia College of Art. He builds and photographs objects in order to understand failure and futility. By making physical objects, the answers to questions of why things failed in the past and why they will fail in the future become simple and more literal. A structure meant to keep everything together fails, not because of the impossibility of the idea, but because of its materiality and the urgency in how it was fabricated. By photographing these objects, Rodriguez can create a fictional function and purpose for the things he builds outside of their material failings. Flowers For Ghosts (Sorry I’m Late) is an 16″ x 20″ inkjet print. It is based on a sculpture created by the artist with a wooden structure, flowers, and a fog machine. There are four slightly different iterations of the image in this series, each taken at a different moment as the fog machine was activated. Each print is an edition of 5.